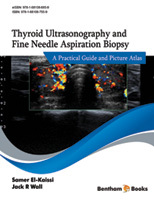 Thyroid ultrasound is used in clinical practice to assess thyroid gland volume and vascularity, assess thyroid nodules and cervical lymph nodes, examine the parathyroid glands in patients with primary hyperparathyroidism, guide biopsies, aspiration and ablation of thyroid and anterior neck structures, and in post-operative thyroid cancer surveillance. However, thyroid ultrasound is not suitable as a screening tool of the thyroid. Ultrasound examination of the thyroid follows a systematic approach beginning with the thyroid gland volume, echogenicity, echotexture, Doppler flow and a detailed examination of any thyroid nodules. This is followed by an examination of the anterior neck cervical lymph nodes, and the parathyroid glands if clinically indicated. The normal thyroid gland is echogenic compared to the neck muscles and displays little or no vascularity on Doppler study. The size of a normal thyroid gland is 4-6 cm in length, 1.3-1.8 cm anteroposteriorly, and the isthmus width is less than 6 mm. The thyroid ultrasound report should provide information about the examination technique, a brief summary of the indications for the ultrasound, detailed findings of the examination, conclusions and management recommendations.